This Demonstration is an interactive virtual pitot tube as used for measuring fluid flow. The fluid is water at room temperature, with mercury contained in the pitot tube. The speed of the fluid can be calculated based on the change in height of fluid contained in the tube. As you move the slider left and right, observe the change in height. You can adjust the water speed (room temperature, ) and observe the change in height of the mercury ( ) contained in the pitot tube. The relationship between fluid speed , in m/s, to the change in height of the fluid in the tube, in meters, is given by the Bernoulli equation (assuming an ideal fluid): , where is the density of the fluid in the tube, is the gravitational constant (9.81 m/s), is the change in height of the column of fluid in the tube, is the density of the fluid in the tube, and is the flow speed of the fluid. The right-hand side of the equation represents what is commonly known as dynamic pressure, or the pressure due to fluid flow. The typical use of this type of device is to measure the speed of fluids (either in the form of liquids or gases). 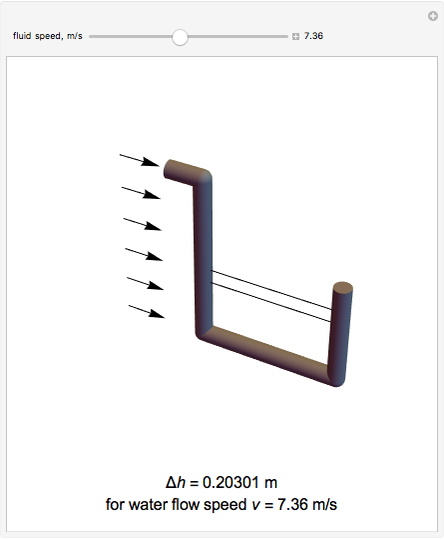 For more information on fluid mechanics, see http://physics-help.info/physicsguide/mechanics/fluid_mechanics.shtml.